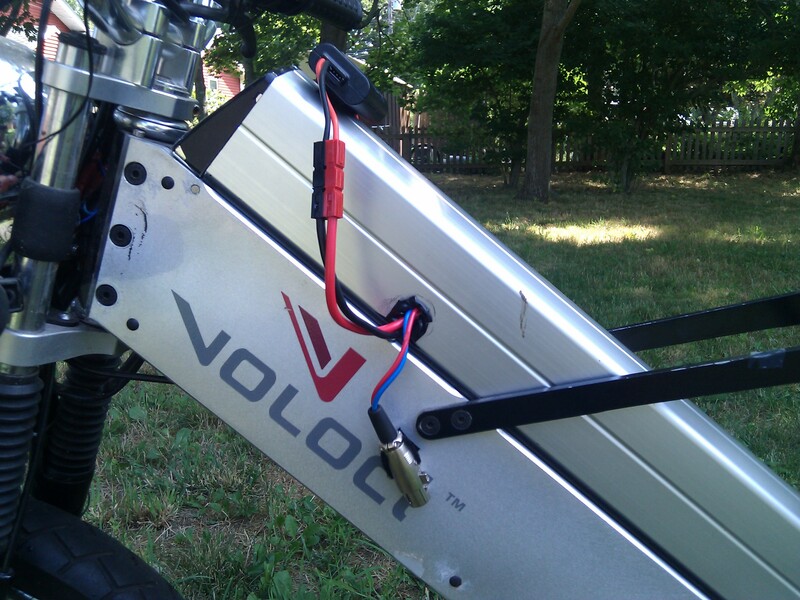 Last summer, I acquired a 36V lead-acid voloci with flat batteries and a questionable controller. 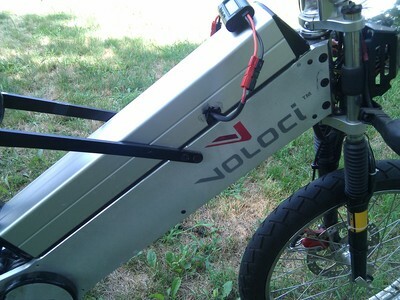 The lead-acid model has an aluminum extrusion over the top of the battery compartment to accomodate the extra space required by three Hawker 12V 16Ah batteries. 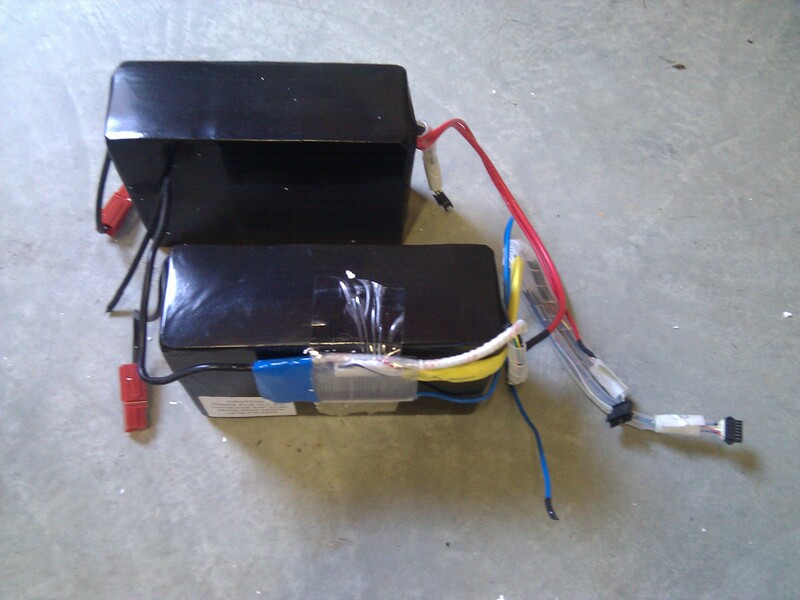 My idea was to replace the 40 pounds of Hawkers with 20Ah of LiFePO4 batteries from Ping, weighing in at 16.5 pounds and running at a typical voltage of 38.4V. This drops a bunch of weight (obviously) and in theory gives more capacity (20Ah vs. 16Ah) and slightly better average voltage. Electrically, this is a simple mod, because the new battery is similar in spec to the old battery, so no controller changes are needed. The voltage is slightly higher so the Voloci won't prematurely cut out at the end of the battery's discharge cycle; instead, the battery's built-in battery management system is responsible for that. 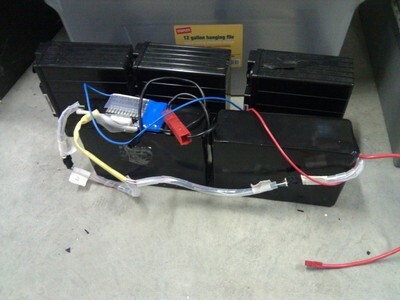 The main obstacle turned out to be the dimensions of the LiFePO4 battery. Volume-wise, it would fit in the Voloci compartment with room to spare, but the compartment is narrow (less than 3 inches wide) and the stock Ping battery would be too wide. 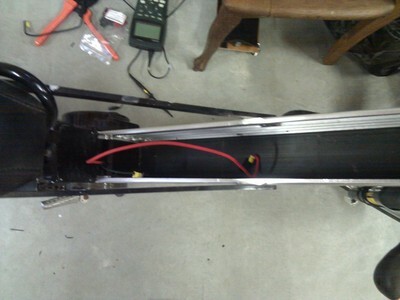 I emailed Ping with the available dimensions, and he indicated that he could build a new battery with a different arrangement, in two pieces that would each be narrow enough, and would have to be wired together to act as one unit. Here's a photo of what he sent me. Ping battery again, with the original batteries behind for comparison. The original charger that Ping sent me was DOA but he sent me a working replacement. It's a 2A charger. I also have the original 4A Soleil charger designed for the original batteries. Ping batts can be charged OK with the Soleil charger, except that the peak voltage of my charger was a bit too low to allow proper balancing. You really need to get to 45V. 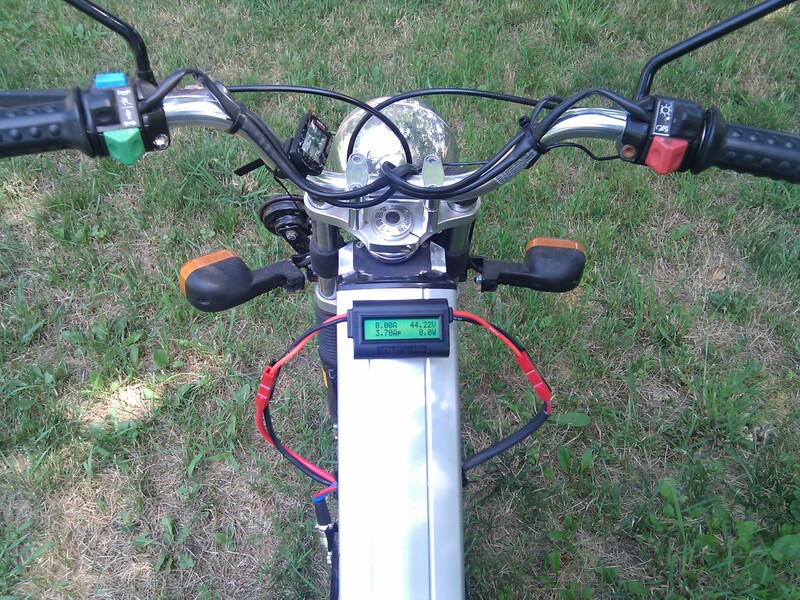 I found the voltage trim inside the Soleil and cranked it all the way up and now it gets to around 43.5V -- OK for the initial charge (and twice as fast) but I still need the Ping to top off and balance the cells. Getting the new batteries in wasn't too hard; basically a matter of some wiring and packing. I used a bunch of rubber and foam to fill up the extra space and try to protect the BMS board as well as possible. Here's my not-very-elegant method of connecting the battery to the bike's controller. I cut a notch in the aluminum battery cover and ran the battery output and charger input out the left side. On the other side, there's a connector for power to the controller, with a similar notch in the battery cover. An essential addition to this project was a Watt's Up meter. It sits in series between the battery and controller and measures the key electrical metrics: voltage, current, and power in real-time, along with cumulative charge (in Amp hours), energy (in Watt hours), peak current and minimum voltage. 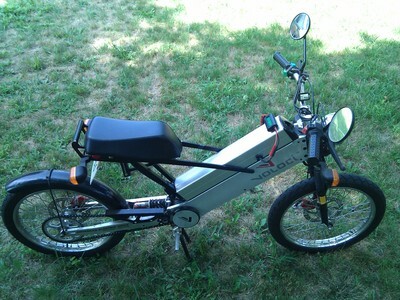 I also got an ordinary Cateye Strada bike computer to measure speed and distance. I finished near the end of last summer so I've only taken a few rides on it, but the longest ride lasted 57 minutes over 16.7 miles, using 17.8 Ah. 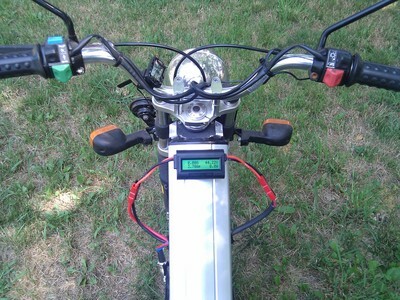 Over the first couple of rides it is averaging just over 1 Ah per mile. The top speed is like 28 mph with a tailwind so it's a bit of a letdown from the 48V Voloci but it's nice to have a properly-mounted battery, and running more or less within the designed limits of the Voloci and the Ping battery. The LiFePO4 battery runs like a champ, with a long, flat discharge curve and not a lot of sag under load. The first test ride ran into several problems. The throttle wiring near the twist-grip turned out to be flaky and I needed to fiddle with it to keep the motor from cutting out randomly. 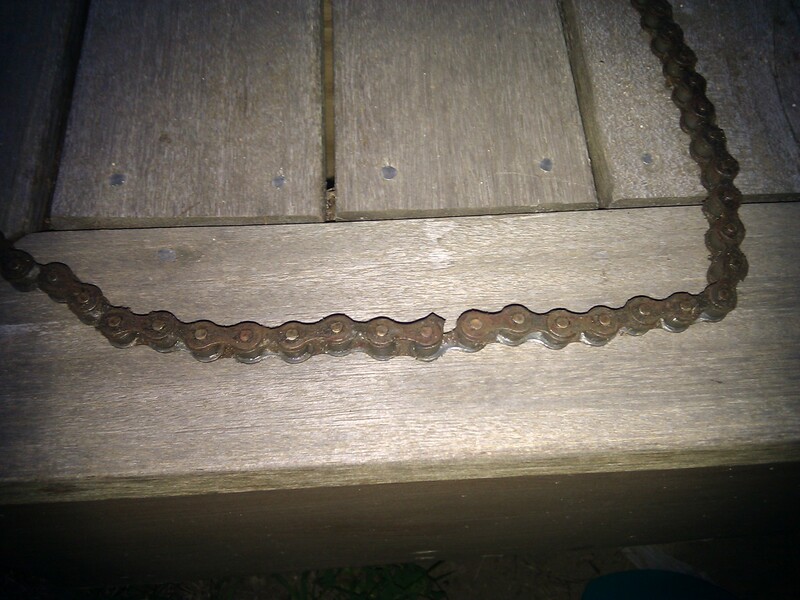 The drive also seemed a bit rough, and after some inspection I discovered that one of the chain links was half-broken, yikes! Fortunately I had a spare. 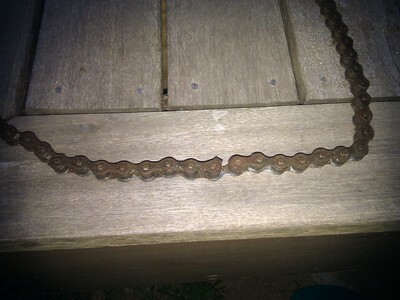 The Voloci chain has a master link so I was able to deal with it using pliers and a screwdriver and whatnot. Battery-wise, it works well so far, although at the end of the long test ride the controller did overheat a couple of times. 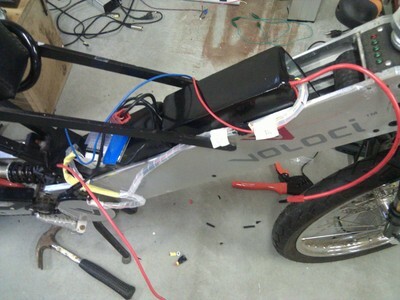 See the 48V project for links to Ping and other wiring supplies. The one major additional part here is the Watt's Up meter, which I found at Tower Hobbies although it's available elsewhere too.